Monday April 15, 2013 - 7:00 p.m.
As part of the Center's Anniversary Series, this event is free and open to the public with required advance online registration. Dr. Grimes is Associate Dean in Office of African-American Affairs and an Associate Professor in the Curry School of Education at University of Virginia. She marched on Bloody Sunday and Turn Around Tuesday, where Bland witnessed fellow activists being shot and beaten by the police National Guard. 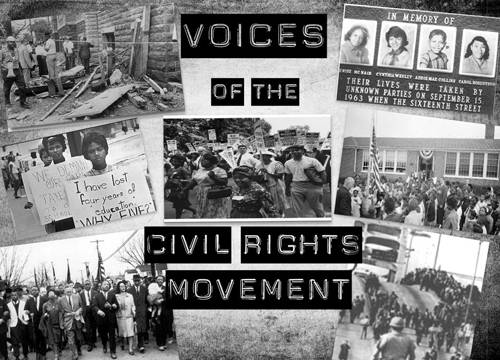 When Edwilda Isaac was 13 years old, she helped lead a march of 400 black students out of their segregated high school and into civil rights history in Farmville Virginia. The protest led to a lawsuit against Prince Edward County that ultimately became part of the U.S. Supreme Court's landmark Brown vs. Board of Education decision. During Massive Resistance, Rita spent two years without any education until her parents sent her to live in a county more than 120 miles away so that she could still attend school. Sarah was the "fifth girl" inside the Ladies' Lounge of the 16th Street Baptist Church in Birmingham, Alabama when a bomb thrown by a member of the KKK detonated almost fifty years ago on Sunday, September 15, 1963 killing her sister and three other little girls. One of a group of black students from Farmville, Virginia that participated in the March on Washington in August 1963 where Martin Luther King Jr. made his "I have a dream" speech. This event is free and open to the public. Online registration is required at http://hoosonline.virginia.edu/civilvoices. If you have any questions, please email Glenn Crossman at cfp-programs@virginia.edu or (434) 243-3540.